Breathable, microporous film laminate combines comfort and protection in a clean apron. Aprons offer a sturdy liquid and particle protection barrier. Impervious film and heat-sealed seams prevent leaking and keep you safe from blood-borne pathogens. Comfortable, 2 mil polyethylene helps you keep cool. 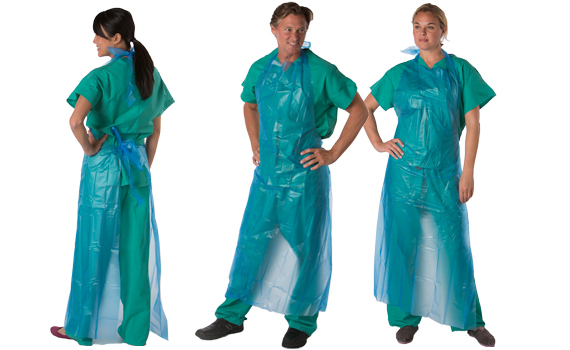 This personal protective apron is easily worn under a sterile gown. Open-back design promotes air circulation and reduces perspiration. One-size-fits-all sizing reduces your inventory. Passes the ASTM Method F 1671 Viral Penetration test. Impervious film and heat-sealed seams prevent leaking and keep you safe from blood-borne pathogens. Comfortable, 2 mil polyethylene helps you keep cool. Easily worn under a sterile gown. Open-back design promotes air circulation and reduces perspiration. One-size-fits-all sizing reduces your inventory. Sloan Medical keeps you covered and keeps you safe with a complete range of disposable, impermeable products. It is our goal to manufacture the highest quality personal protective equipment for our customers. We focus on creating and maintaining excellence in all aspects of the business from our knowledgeable customer service to our fast and reliable shipping. Our product lines are guaranteed to perform in all types of environments, offer easy clean-up, and provide total protection all at reasonable prices. With a variety of styles, sizes, and features from which to choose, you can find the right protective gear to fit your needs and budget. You can count on Sloan Medical for full satisfaction on every product we offer. Exceeding expectations is always our principal area of concern, and we make sure that all our products meet or surpass the demanding medical industry standards. A quality-oriented approach is followed from start to finish so that our products reach our clients in the best possible shape. This approach has enabled us to gain the trust of our clients all across the world. We are interested in discussing your questions so please contact us for more information.